These large, beautifully constructed dreamcatchers evoke a celestial display with their careful and skilled stitching. 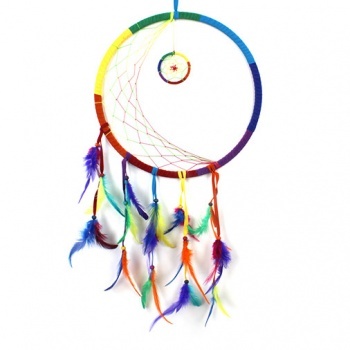 Made with rainbow nylon string and wonderfully eye catching rainbow feathers. Dreamcatchers were used as a protective charm, especially for children, to protect against nightmares.